"Space Ship One" redirects here. For the album by Paul Gilbert, see Space Ship One (album). SpaceShipOne after its flight into space, June 21, 2004. SpaceShipOne is an experimental air-launched rocket-powered aircraft with sub-orbital spaceflight capability at speeds of up to 900 m/s (3,000 ft/s), using a hybrid rocket motor. The design features a unique "feathering" atmospheric reentry system where the rear half of the wing and the twin tail booms folds 70 degrees upward along a hinge running the length of the wing; increasing drag while remaining stable. SpaceShipOne completed the first manned private spaceflight in 2004. That same year, it won the US$10 million Ansari X Prize and was immediately retired from active service. Its mother ship was named "White Knight". Both craft were developed and flown by Mojave Aerospace Ventures, which was a joint venture between Paul Allen and Scaled Composites, Burt Rutan's aviation company. Allen provided the funding of approximately US$25 million. Rutan has indicated that ideas about the project began as early as 1994 and the full-time development cycle time to the 2004 accomplishments was about three years. The vehicle first achieved supersonic flight on December 17, 2003, which was also the one-hundredth anniversary of the Wright Brothers' historic first powered flight. SpaceShipOne's first official spaceflight, known as flight 15P, was piloted by Mike Melvill. A few days before that flight, the Mojave Air and Space Port was the first commercial spaceport licensed in the United States. A few hours after that flight, Melvill became the first licensed U.S. commercial astronaut. The overall project name was "Tier One" which has evolved into Tier 1b with a goal of taking a successor ship's first passengers into space. SpaceShipOne's official model designation is Scaled Composites Model 316. Carry three humans (one of them a pilot) in a sea-level pressurized cabin. Be propelled by rocket from an altitude of 15 km (9.3 mi) to in excess of 100 km (62 mi). Reenter atmosphere and shed kinetic energy in an aerodynamically stable configuration. Land horizontally on a standard runway. The fuselage is cigar-shaped, with an overall diameter of about 1.52 m (5 ft 0 in). The main structure is of a graphite/epoxy composite material. From front to back, it contains the crew cabin, oxidizer tank, fuel casing, and rocket nozzle. The craft has short, wide wings, with a span of 5 m (16 ft) and a chord of 3 m (9.8 ft). There are large vertical tailbooms mounted on the end of each wing, with horizontal stabilizers protruding from the tailbooms. It has gear for horizontal landings. The overall mass of the fully fueled craft is 3,600 kg (7,900 lb), of which 2,700 kg (6,000 lb) is taken by the fully loaded rocket motor. Empty mass of the spacecraft is 1,200 kg (2,600 lb), including the 300 kg (660 lb) empty motor casing. Originally the nozzle protruded from the back, but this turned out to be aerodynamically disadvantageous. In June 2004, between flights 14P and 15P, a fairing was added, smoothly extending the fuselage shape to meet the flared end of the nozzle. On flight 15P the new fairing overheated, due to being black on the inside and facing a hot, black nozzle. The fairing softened, and the lower part crumpled inwards during boost. Following that flight the interior of the fairing was painted white, and some small stiffening ribs were added. The craft has a single unsteerable and unthrottleable hybrid rocket motor, a cold gas reaction control system, and aerodynamic control surfaces. All can be controlled manually. See the separate section below concerning the rocket engine. The reaction control system is the only way to control spacecraft attitude outside the atmosphere. It consists of three sets of thrusters: there are thrusters at each wingtip to control roll, at the top and bottom of the nose to control pitch, and at the sides of the fuselage to control yaw. All thrusters have redundant backups, so there are twelve thrusters in all. The aerodynamic control surfaces of SpaceShipOne are designed to operate in two distinct flight regimes, subsonic and supersonic. The supersonic flight regime is of primary interest during the boost phase of a flight, and the subsonic mode when gliding. There are separate upper and lower rudders, and elevons. These are controlled using aviation-style stick and pedals. In supersonic mode the trim tabs are controlled electrically, whereas the subsonic mode uses mechanical cable-and-rod linkage. An early design called for a permanently shuttlecock-like shape, with a ring of feather-like stabilising fins. This would have made the spacecraft incapable of landing independently, requiring mid-air retrieval. This was deemed too risky, and the hybrid final design manages to incorporate the feathering capability into a craft that can land in a conventional manner. The tiltable rear sections of the wings and the tailbooms are collectively referred to as "the feather". The landing gear consists of two widely separated main wheels and a nose skid. These are deployed using springs, assisted by gravity. Once deployed, they cannot be retracted inflight. The spacecraft is incapable of independent takeoff from the ground. It requires a launch aircraft to carry it to launch altitude for an air launch. The parts of the craft that experience the greatest heating, such as the leading edges of the wings, have about 6.5 kg (14 lb) of ablative thermal protection material applied. The main ingredient of this material was accidentally leaked to Air and Space[clarification needed]. If it flew with no thermal protection, the spacecraft would survive reentry but would be damaged. There is an acknowledged "known deficiency" with the spacecraft's aerodynamic design that makes it susceptible to roll excursions. This has been seen on SpaceShipOne flight 15P where wind shear caused a large roll immediately after ignition, and SpaceShipOne flight 16P where circumstances not yet fully understood caused multiple rapid rolls. This flaw is not considered dangerous, but in both of these flights led to the achievement of a much lower altitude than expected. The details of the flaw are not public. The spacecraft cabin, designed to hold three humans, is shaped as a short cylinder, diameter 1.52 m (5 ft 0 in), with a pointed forward end. The pilot sits towards the front, and two passengers can be seated behind. The cabin is pressurized, maintaining a sea level breathable atmosphere. Oxygen is introduced to the cabin from a bottle, and carbon dioxide and water vapor are removed by absorbers. The occupants do not wear spacesuits or breathing masks, because the cabin has been designed to maintain pressure in the face of faults: all windows and seals are doubled. The cabin has sixteen round double-pane windows, positioned to provide a view of the horizon at all stages of flight. The windows are small compared to the gaps between them, but there are sufficiently many for human occupants to patch together a moderately good view. The nose section can be removed, and there is also a hatch below the rear windows on the left side. Crew ingress and egress is possible by either route. The core of the spacecraft avionics is the System Navigation Unit (SNU). Together with the Flight Director Display (FDD), it comprises the Flight Navigation Unit. The unit was developed jointly by Fundamental Technology Systems and Scaled Composites. The SNU is a GPS-based inertial navigation system, which processes spacecraft sensor data and subsystem health data. It downlinks telemetry data by radio to mission control. The FDD displays data from the SNU on a color LCD. It has several distinct display modes for different phases of flight, including the boost phase, coast, reentry, and gliding. The FDD is particularly important to the pilot during the boost and coast phase in order to "turn the corner" and null rates caused by asymmetric thrust. A mix of commercial and bespoke software is used in the FDD. Tier One uses a hybrid rocket motor supplied by SpaceDev, with solid hydroxyl-terminated polybutadiene (HTPB, or rubber) fuel and liquid nitrous oxide oxidizer. It generates 88 kN (20,000 lbf) of thrust, and can burn for about 87 s (1.45 min). The physical layout of the engine is novel. The oxidizer tank is a primary structural component, and is the only part of the engine that is structurally connected to the spacecraft: the tank is in fact an integral part of the spacecraft fuselage. The tank is a short cylinder of diameter approximately 1.52 m (5 ft 0 in), with domed ends, and is the forwardmost part of the engine. The fuel casing is a narrow cylinder cantilevered to the tank, pointing backwards. The cantilevered design means that a variety of motor sizes can be accommodated without changing the interface or other components. The nozzle is a simple extension of the fuel casing; the casing and nozzle are actually a single component, referred to as the CTN (case, throat, and nozzle). Burt Rutan has applied for a patent on this engine configuration. There is considerable use of composite materials in the engine design. The oxidizer tank consists of a composite liner with graphite/epoxy over-wrap and titanium interface flanges. The CTN uses a high-temperature composite insulator with a graphite/epoxy structure. Incorporating the solid fuel (and hence the main part of the engine) and the ablative nozzle into this single bonded component minimizes the possible leak paths. The oxidizer tank and CTN are bolted together at the main valve bulkhead, which is integrated into the tank. There are O-rings at the interface to prevent leakage; this is the main potential leak path in the engine. The ignition system, main control valve, and injector are mounted on the valve bulkhead, inside the tank. Slosh baffles are also mounted on this bulkhead. Because the oxidizer is stored under pressure, no pump is required. The tank liner and the fuel casing are built in-house by Scaled Composites. The tank over-wrap is supplied by Thiokol. The ablative nozzle is supplied by AAE Aerospace. The oxidizer fill, vent, and dump system is supplied by Environmental Aeroscience Corporation. The remaining components—the ignition system, main control valve, injector, tank bulkheads, electronic controls, and solid fuel casting—are supplied by SpaceDev. The CTN must be replaced between firings. This is the only part of the craft, other than the fuel and oxidizer themselves, that must be replaced. The solid fuel is cast with four holes. This has the disadvantage that it is possible for chunks of fuel between the holes to become detached during a burn and obstruct the flow of oxidizer and exhaust. Such situations tend to rapidly self-correct. The oxidizer tank is filled and vented through its forward bulkhead, on the opposite side of the tank from the fuel and the rest of the engine. This improves safety. It is filled to a pressure of 4.8 MPa (700 psi) at room temperature. The nozzle has an expansion ratio of 25:1, which is optimized for the upper part of the atmosphere. A different nozzle, with an expansion ratio of 10:1, is used for test firing on the ground. The nozzles are black on the outside, but for aerodynamic testing, red dummy nozzles are used instead. Both the fuel and oxidizer can be stored without special precautions, and they do not burn when brought together without a significant source of heat. This makes the rocket far safer than conventional liquid or solid rockets. It is also relatively non-polluting: the combustion products are water vapor, carbon dioxide, hydrogen, nitrogen, and some carbon monoxide. The engine was upgraded in September 2004, between flights 15P and 16P. The upgrade increased the oxidizer tank size, to provide greater thrust in the early part of the burn, allow a longer burn, and delay the onset of the variable thrust phase at the end of the burn. Prior to the upgrade the engine generated 76 kN (17,000 lbf) of thrust and could burn for 76 s (1.27 min). After the upgrade it was capable of 88 kN (20,000 lbf) thrust and an 87 s (1.45 min) burn. This section is about design. For information on flights made by White Knight, see Scaled Composites White Knight. Tier One's launch aircraft, Scaled Composites model 318, known as White Knight, is designed to take off and land horizontally and attain an altitude of about 15 km (9.3 mi), all while carrying the Tier One spacecraft in a parasite aircraft configuration. Its propulsion is by twin turbojets: afterburning J-85-GE-5 engines, rated at 15.6 kN (3,500 lbf) of thrust each. It has the same cabin, avionics, and trim system as SpaceShipOne. This means it can flight-qualify almost all components of SpaceShipOne. It also has a high thrust-to-weight ratio and large speed brakes. These features combined allow it to be used as a high-fidelity moving platform flight simulator for SpaceShipOne. White Knight is also equipped with a trim system which (when activated) causes it to have the same glide profile as SpaceShipOne; this allows the pilots to practice for landing SpaceShipOne. The same pilots fly White Knight as fly SpaceShipOne. The aircraft's distinctive shape features long, thin wings, in a flattened "W" shape, with a wingspan of 25 m (82 ft), dual tailplanes, and four wheels (front and rear at each side). The rear wheels retract, but the front ones, which are steerable, are permanently deployed, with small fairings, referred to as "spats", in front. Another way to look at the overall shape is as two conventional planes, with very thin fuselages, side-by-side and joined together at their wingtips, with the cockpit and engines mounted at the point of joining. Although White Knight was developed for certain roles in the Tier One program, it is a very capable aircraft in its own right. Scaled Composites describe it as a "high-altitude research aircraft". SpaceShipOne takes off from the ground, attached to White Knight in a parasite configuration, and under White Knight's power. The combination of SpaceShipOne and White Knight can take off, land, and fly under jet power to high altitude. A captive carry flight is one where the two craft land together without launching SpaceShipOne; this is one of the main abort modes available. For launch, the combined craft flies to an altitude of around 14 km (8.7 mi), which takes about an hour. SpaceShipOne is then drop-released, and briefly glides unpowered. Rocket ignition may take place immediately, or may be delayed. If the rocket is never lit then SpaceShipOne can glide down to the ground. This is another major abort mode, in addition to being flown deliberately in glide tests. The rocket engine is ignited while the spacecraft is gliding. Once under power, it is raised into a 65° climb, which is further steepened in the higher part of the trajectory. The maximum possible acceleration is about 4 g.
By the end of the burn the craft is flying upwards at some multiple of the speed of sound, up to about 900 m/s (3,000 ft/s) and Mach 3.5, and it continues to coast upwards unpowered (i.e. ballistically). If the burn was long enough then it will exceed an altitude of 100 km (62 mi), at which height the atmosphere presents no appreciable resistance, and the craft experiences free fall for a few minutes. While at apogee the wings are reconfigured into high-drag mode. As the craft falls back it achieves high speeds comparable to those achieved on the way up; when it subsequently reenters the atmosphere it decelerates violently, up to about 5 g. At some altitude between 10 km (6.2 mi) and 20 km (12 mi) it reconfigures into low-drag glider mode, and glides down to a landing in about 20 minutes. White Knight takes longer to descend, and typically lands a few minutes after SpaceShipOne. SpaceShipOne was registered with the FAA as N328KF'. N is the prefix for US-registered aircraft; 328KF" was chosen by Scaled Composites to stand for 328 kilofeet (about 100 kilometers), the officially designated edge of space. The original choice of registry number, N100KM, was already taken. N328KF is registered as a glider, reflecting the fact that most of its independent flight is unpowered. 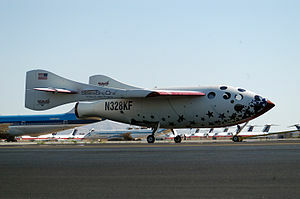 SpaceShipOne's first flight, 01C, was an unmanned captive flight test on May 20, 2003. Glide tests followed, starting with flight 03G on August 7, 2003. Its first powered flight, flight 11P, was made on December 17, 2003, the 100th anniversary of the first powered flight. On April 1, 2004, Scaled Composites received the first license for suborbital rocket flights to be issued by the US Office of Commercial Space Transportation. This license permitted the company to conduct powered test flights over the course of one year. On June 17, 2004, under the leadership of airport CEO Stuart O. Witt, Mojave Airport reclassified itself as the Mojave Air and Space Port. Flight 15P on June 21, 2004, was SpaceShipOne's first spaceflight, and the first privately funded human spaceflight. There were a few control problems, but these were resolved prior to the Ansari X PRIZE flights that followed, with flight 17P to 112 km on October 4, 2004, winning the prize. The SpaceShipOne Team was awarded the Space Achievement Award by the Space Foundation in 2005. All of the flights of SpaceShipOne were from the Mojave Airport Civilian Flight Test Center. Flights were numbered, starting with flight 01 on May 20, 2003. One or two letters are appended to the number to indicate the type of mission. An appended C indicates that the flight was a captive carry, G indicates an unpowered glide, and P indicates a powered flight. If the actual flight differs in category from the intended flight, two letters are appended: the first indicating the intended mission and the second the mission actually performed. SpaceShipOne ranks among the world's first spaceplanes in the first 50 years of human spaceflight, with the North American X-15, Space Shuttle, Buran, and Boeing X-37. SpaceShipOne is the second spaceplane to have launched from a mother ship, preceded only by the North American X-15. The flights were accompanied by two chase planes—an Extra 300 owned and flown by Chuck Coleman, and a Beechcraft Starship. The SpaceShipOne pilots came from a variety of aerospace backgrounds. Mike Melvill is a test pilot, Brian Binnie is a former Navy pilot, and Peter Siebold is an engineer at Scaled Composites. They qualified to fly SpaceShipOne by training on the Tier One flight simulator and in White Knight and other Scaled Composites aircraft. SpaceShipOne now hangs in the National Air and Space Museum in Washington, D.C.
SpaceShipOne's spaceflights were watched by large crowds at Mojave Spaceport. A fourth suborbital flight, Flight 18P, was originally scheduled for October 13, 2004. However, Burt Rutan decided not to risk damage to the historic craft, and cancelled it and all future flights. On July 25, 2005 SpaceShipOne was taken to the Oshkosh Airshow in Oshkosh, Wisconsin. After the airshow, Mike Melvill and crew flew the White Knight, carrying SpaceShipOne, to Wright-Patterson Air Force Base in Dayton, Ohio, where Melvill spoke to a group of about 300 military and civilian personnel. Later in the evening, Melvill gave a presentation at the Dayton Engineers Club, entitled "Some Experiments in Space Flight", in honor of Wilbur Wright's now-famous presentation to the American Society of Mechanical Engineers in 1901 entitled "Some Experiments in Flight." The White Knight then transported SpaceShipOne to the Smithsonian Institution's National Air and Space Museum to be put on display. It was unveiled on Wednesday October 5, 2005 in the Milestones of Flight gallery and is now on display to the public in the main atrium with the Spirit of St. Louis, the Bell X-1, and the Apollo 11 command module Columbia. Commander Brian Binnie donated the flight suit and checklist used during his Ansari X Prize-winning flight to an auction benefitting Seattle's Museum of Flight. Entertainer and fundraising auctioneer Fred Northup, Jr. purchased the flight suit and checklist book, and the flight suit is on display at the museum's Charles Simonyi Space Gallery. SpaceShipOne became a popular model rocket in 2004. A piece of SpaceShipOne's carbon fiber material was launched aboard the New Horizons mission to Pluto in 2006. EAA replica in both feathered and normal configuration. 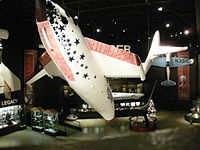 A year after its appearance in the Oshkosh Airventure airshow, the Experimental Aircraft Association featured a full-scale replica of the spacecraft in a wing of its museum which housed other creations of Burt Rutan. Using the same fiberglass molds as the original, it was so exact in its replication—despite not having any doors or interior—that it was dubbed "Serial 2 Scaled" by Scaled Composites. Each detail in its appearance was matched, down to the N328KF registration number on its fuselage. It is so precise that, during a 7 minute video presentation held every hour on the half hour in the museum, it can display the two different modes of its 'feathering' ability, albeit through the aid of pulleys and wires (there is no machinery in the replica). Other full-scale replicas are at the William Thomas Terminal at Meadows Field Airport in Bakersfield, the Mojave Spaceport's Legacy Park alongside the original Roton Atmospheric Test Vehicle, the Flying Heritage Collection at Paine Field in Everett, and Google's Mountain View Campus. With the success of Tier One meeting its project goals, a successor project started in 2004 was Tier 1b. The successor ships are named SpaceShipTwo and White Knight Two. The name of the joint venture between Virgin Group and Scaled Composites is called The Spaceship Company, with a goal of carrying passengers under the name Virgin Galactic, a spaceliner with an initial target of a commercial fleet of five spacecraft. In August 2005, Virgin Galactic stated that if the upcoming suborbital service with SpaceShipTwo is successful, the follow-up will be known as SpaceShipThree. Hybrid rocket engine detail of SpaceShipOne (more information). ^ Hoffman, Carl (22 May 2007). "Elon Musk Is Betting His Fortune on a Mission Beyond Earth's Orbit". Wired. Retrieved 30 August 2007. ^ Foust, Jeff (21 June 2004). "Prelude to history?". The Space Review. SpaceNews. Retrieved 21 December 2015. ^ a b c d "SpaceShip One". www.astronautix.com. ^ "FAA Registry (N328KF)". Federal Aviation Administration. ^ Brekke, Dan (7 July 2004). "SpaceShipOne Back on Course". Wired. Archived from the original on 7 December 2008. Retrieved 8 July 2004. ^ a b "FAI Record ID #9881 – Altitude above the earth's surface with or without maneuvres of the aerospacecraft, Class P-1 (Suborbital missions) Archived 2015-10-18 at the Wayback Machine" Mass Archived 2015-09-24 at the Wayback Machine Time Archived 2015-09-24 at the Wayback Machine Fédération Aéronautique Internationale (FAI). Retrieved: 21 September 2014. ^ "Symposium Awards". Archived from the original on 2009-02-03. Retrieved 2012-01-31. ^ a b c d e f g h i j k l m n o p "SpaceShipOne Flight Tests". Scaled Composites. Archived from the original on 2010-08-22. ^ Jefferson, Catherine A. "First Private Manned Space Flight". devsite.org. Archived from the original on 8 October 2007. Retrieved 12 January 2007. ^ David, Leonard (27 February 2015). "NASA Probe Bound for Pluto Carries Piece of Pioneering SpaceShipOne". Space.com. Retrieved 25 August 2016. ^ "EAA/Scaled Composites SpaceShipOne – Replica". EAA AirVenture Museum. Archived from the original on 2 May 2008. Retrieved 21 June 2008. ^ "Scaled Composites SpaceShipOne". Flying Heritage Collection. Archived from the original on 12 March 2012. Retrieved 22 January 2012. ^ Beale, Scott (24 April 2007). "Google SpaceShipOne Replica and T-Rex Skeleton". Laughing Squid. Retrieved 27 May 2012. ^ David, Leonard (26 February 2007). "Virgin Galactic Spaceliner Steps Forward". Space.com. Retrieved 7 July 2007. ^ Hecht, Jeff (29 July 2005). "Space tourism company to fly in 2008". New Scientist. Retrieved 7 July 2007. ^ Coppinger, Rob (23 August 2005). "SpaceShipThree poised to follow if SS2 succeeds". London: Flightglobal. Retrieved 7 July 2007. ^ jnhtx (87543) (30 July 2006). "Notes on Rutan presentations at EAA Oshkosh". Slashdot. Retrieved 7 July 2007. 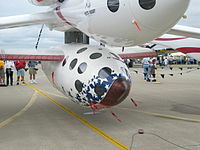 Wikimedia Commons has media related to SpaceShipOne.